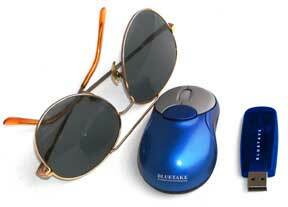 BlueTake Technology’s new BT500 Bluetooth Mouse is a zippy little portable 2-button optical mouse with scroll wheel. A perfect companion for those of us who use a laptop and need more precise cursor control than a trackpad allows – with cordless convenience! The Bluetooth USB Receiver included with the mouse is about the size of a typical USB Flash Drive and is a multi-purpose receiver – it should work with most Bluetooth products including cell phones and Bluetooth enabled PDAs. Since some companies (starts with an M and has a dollar $ign in the middle) include proprietary receivers that only work with their mice, it’s nice to have just one receiver that will work with all your Bluetooth devices (the BT500 is also available (MSRP $59.00 US) without Bluetooth USB receiver). The mouse itself is tiny; less than 3 inches long and about one and a half inch wide, but masterfully designed. The battery compartment is sturdy and the ergonomics are about as perfect as you can get at this sportingly small size. The weight is 64 grams without the batteries; with the batteries, it has enough heft and stability to take moderate abuse, but feels like a fine precision instrument. Included in the package is a 7-page manual for the mouse itself, plus a 78-page manual covering software installation, configuring, etc., etc, etc. Yep, I said “a 78 page manual”. But don’t let this intimidate you! For I, dear reader… I eat manuals like this for breakfast. Stand back and leave it to me to digest these 85 pages into a simple 3-step instruction. Step 1. Firmly place the 78-page manual along with the two Mini-CDs in the trash. Step 2. Open System Preferences panel and click Bluetooth. Click the “pare device” buttons. Step 3. There is no step 3. I left out a few details, like inserting the batteries and hitting the ON switch, but you get the idea – OS X handles Bluetooth like a champ. Which brings me to another nice feature of this mouse – the ON/OFF switch. You will find that many Bluetooth mice don’t have an ON/OFF switch, since they automatically go to sleep after a few minutes. But if your mouse is jostled around inside your knapsack or laptop bag, it’s going to be turning on and off constantly wasting precious battery-life. The ON/OFF switch is neatly located beneath the BT500 mouse, where it is out of the way and recessed enough to avoid accidental switching. Battery life is decent, but not remarkable. With the included AAA batteries, I got about seven days’ use. But I put this baby through some VERY HEAVY usage. No mercy. We’re talking 16-hour days here folks. No coffee breaks! Bathroom only in emergencies! Keep a spare pair of rechargeable batteries with you. When the batteries go low, the mouse just stops working, necessitating a battery change on the fly. Thankfully, the battery compartment snaps open in a flash and if you have a couple of replacements on hand, a battery change takes only a few seconds. Of course, the first thing I did with this mouse was to test it out in the various versions of Unreal Tournament. It worked perfectly without having to configure anything except the Mouse Sensitivity. Its 800 dpi optical sensor is a lot zippier than any of my other mice. Slowing down Mouse Sensitivity a bit increased my precision markedly. After several hours of DeathMatch with my friend Bill, and winning more than half the maps played (he’s pretty good), I decided that this was going to be my favorite mouse for fragging. The BT500 also performed very admirably in several highly detailed PhotoShop projects. I was impressed with its accuracy and dependability. The small mouse glides effortlessly across any surface with precise cursor tracking and, despite its diminutive size, produced no finger fatigue with prolonged use. My contract with MyMac.com clearly states that I can only use my superhuman eyesight for the “betterment of mankind”, so I took the mouse clear across the room, and controlled the Macintosh from way back by the birdcage. Yeah, I know! I was impressed too! That’s like 20 feet away! I eat a lot of carrots. The B500 is an excellent product for everyday use. If it had a recharging dock, I would have very little reason not to give it my highest recommendation. It’s not the perfect mouse for everybody; it’s really very small and you have to live with the fact that the batteries will expire while you’re working. But if you have a need for a miniscule mouse without the tether of a cord, the B500 is a real performance machine.